The cellular RIG-like receptors (RLR) belong to an innate sensor pathway that recognize RNA virus products and activates cellular antiviral state. Upon viral infection, RIG-I(AF038963:9606) and related RNA helicases, MDA5(AF095844) and LGP2(AF095844) recognize viral “foreign” RNA and trigger intracellular signaling events that induce innate immunity, the first line of defense against microbial infection. These sentry proteins initiate a signaling cascade by interacting with the downstream partner MAVS, located to the mitochondria. 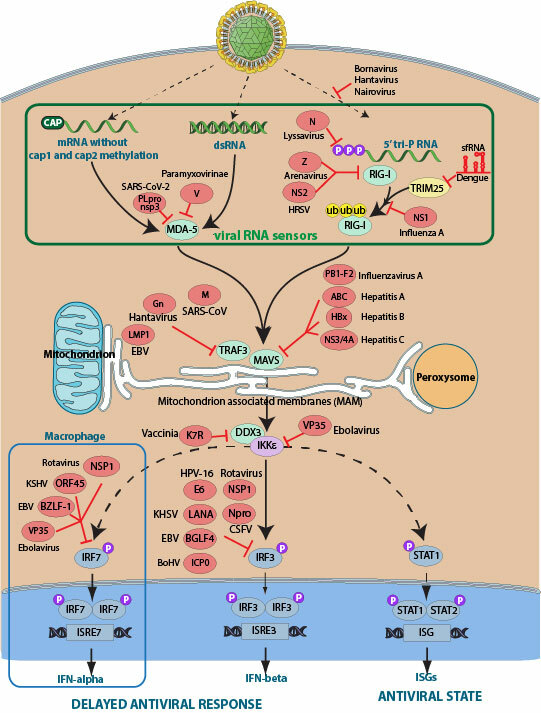 Downstream signaling, resulting in the production of cytokines and interferons, has been linked to a number of pathways that ultimately activate transcription factors IRF3(Z56281:9606), IRF7(U73036:9606) and NF-kappa-B(M55643:9606). Many viral antagonists of the signaling cascade leading to interferon production have been identified. The influenza A virus NS1(P03496) protein has been shown to inhibit RIG-I(AF038963:9606) through direct interaction, while paramyxovirus V(P0C774) protein binds and inhibits MDA5(AF095844) to abrogate its signaling actions. Hepatitis viruses A, B and C affect the cascade by impairing MAVS protein. Downstream, cellular IRF3(Z56281:9606) and IRF7(U73036:9606) can be activated by both RLR and TLR pathway, and are targeted by many viruses including Epstein-Barr virus, Ebolaviruses, Rotaviruses or Papillomaviruses. Comments MAVS is often described as activating IKBKE (IKK-i or IKK epsilon(M55643:9606) and/or TBK1 kinases that phosphorylates IRF3. Most results suggest that the IKBKE kinase is preferentially activated by RLR when TBK1 would be activated by TLRs and DNA sensors . There are evidences showing direct activation of ISG (Interferon Stimulated Genes)upon IKBKE activation. IKBKE could activate STAT1-STAT2 to induce this response . Arenavirus nucleoprotein targets interferon regulatory factor-activating kinase IKK?